bug one resolved, at least in one mall, thanks to Apple | What Will We Use? 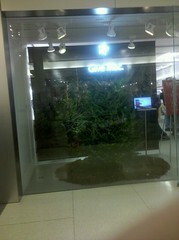 There happens to be an Apple store in South Hills Village Mall. I checked it out after photographing the Droid booth. For those who have never been to an Apple store, it is a place were one can go and buy all sorts of Apple computers, iPods, iPhones, MacOSX software. There you will find little kids (about 8 and below) playing games on Apple desktop. For the big kids there are desktops and ipods you can actually use to see if you like it. If you buy an Apple computer, there is a “Genius Bar” full of Apple-trained experts who will sit with you and help you through your issue. They also have free in-store classes on how to use their software and hardware. This is why customers love Apple computers instead Windows… customer service. This particular Apple store was packed, presumably following the store tree’s directions “Give Mac.” With 48 cents of every dollar being spent on Apple in the desktop market, it makes me wonder, does Nick already owe me twenty dollars? If Apple gets 48 cents, then surely PC vendors who ship Linux could be getting at least two cents of the action. With Linux offerings from HP, Dell, and Lenovo, the big names are covered. Heck, it is not hard to find a eeePC running Linux if you really want one. How about Penguin Computing, Linux Certified, System 76, Zareason, and other countless Linux specialty or Linux friendly white box vendors? All of these companies would not be in business if there was no money to be made by competing with Microsoft. Once ChromeOS kicks in, it will be all over for Microsoft Windows. No matter how you look at it, the gap on Microsoft’s market share is shrinking. What do you think readers? Does Nick already owe me $20? Pingback: Apple puts a cap in Microsoft – What Will We Use on June 30, 2011?